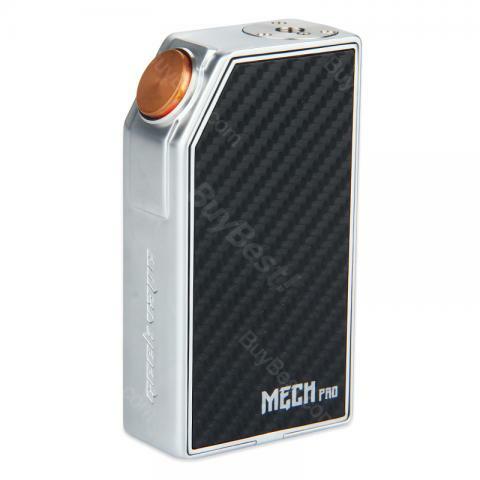 About this MECH Pro MOD, you must notice its new updated function systems, like the visible circuit and fire button lock system. These are the shining points that will make this mod a beast and stand out. The MECH Pro MOD will work perfectly with 1 or 2 pieces 18650 battery. About this vape mod, you must notice its new updated function systems, like the visible circuit and fire button lock system. These are the shining points that will make this mod a beast and stand out. Moreover, you are gonna love its interchangeable cover plates once you hold it in your hand. Also, we highly recommend you to use this MECH MOD with the Medusa RDTA Tank. These 2 will surely make a perfect team for massive cloud and best flavor. Because the Medusa RDTA Tank has this innovative drip fill system and the short shaft section, which will make sure that both the Pro MOD and the Medusa Tank will totally show their shining points out. We are presenting you Silver, Black, and Red color. Tolles Gerät!!! Mit etwas Übung geht GeekVape MECH Pro MOD sehr schnell, die zigaretten werden echt wie gekaufte. GeekVape MECH Pro MOD is high quality and perfect for me! Love GeekVape, love this mod!